I love wearing glitters as my accent nail. I'm not really into wearing a full glitter mani, so the accent nail is perfect for me. 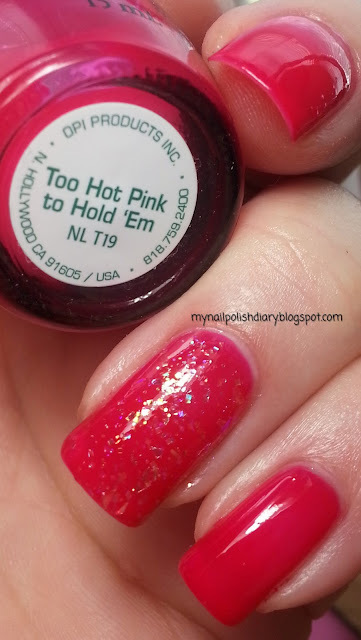 OPI Too Hot Pink To Hold 'Em is from the Texas collection that was released spring 2011. Obviously from the name, it's a hot pink jelly. 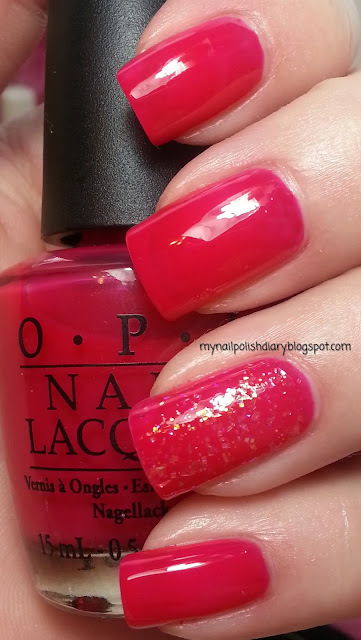 OPI calls it sorbet. Either way it's a lovely, squishy, shiny, hot pink. I have worn this color so many times and I just don't get tired of it. For the accent nail I used OPI I Lily Love You from the summer 2010 Nice Stems collection. It's multi colored irridescent glitter in a sheer pink base. It works perfectly over THPTHE. Just the right about of sparkle to spice up this mani.